Burnout and disengagement are epidemic in healthcare. Increasing government regulations, payor demands, and the electronic medical record (EMR) place tremendous stress on the system. Individuals become overwhelmed, discouraged, and disengaged. All too often, they cut back, quit or retire. This paper addresses the growing problem of burnout among healthcare professionals and provides a framework to address the critical issue of mindset and its impact on the mission of the organization. Frankly, we need to take better care of each other. It is no longer enough to focus on engagement. In order to adapt and thrive, the healthcare culture needs to evolve from one of isolated individuals that consider their own needs, to one where individuals care deeply about the success of their teammates and the teams with whom they interact. As politicians battle over new programs, healthcare organizations struggle to meet the increasing demand caused by an aging population with uncertain insurance coverage. According to the Association of American Medical Colleges, total physician demand is projected to grow by up to 17 percent and by 2025, demand for physicians will exceed supply by a range of 46,000 to 90,000.1 This places an unhealthy burden on the physicians in practice as they try to manage the increasingly overwhelming load. As reimbursement rates decline and overhead increases, physicians have been forced to see more patients per hour and nurses carry a greater load than ever before. The whole team is under increasing pressure. The electronic health record (EHR) adds an additional level of stress and further contributes to burnout. Healthcare workers struggle to make eye contact with patients as they strive to meet increasing documentation requirements. The EHR is frustrating for both the physicians and the patients. Hospitals and healthcare organizations are struggling to keep their physicians. The average cost to replace an emergency physician is $164,000.5 Rapid turnover places an additional burden on a healthcare system that is already struggling with shortages. Implementing cost saving guidelines requires engagement, compromise and a willingness to change. Burned out providers often lack the motivation required to make the individual changes necessary to standardize care.9 This can cost an organization millions of dollars in lost savings opportunities. Ultimately, patients are impacted as well. They are the ones that suffer from medication errors, irritable staff, or a missed diagnosis. Because of provider shortages, not only do patients experience shorter visits but they may find it difficult or impossible to be seen promptly when they need it most. Patients suffer the most from turnover. 18% of the American workforce as a whole is actively disengaged! Gallop estimates that they cost the US economy between $450 billion to $550 billion a year.11 They just quietly go about sabotaging the efforts of the organization and their co-workers, and they are usually never caught. Consider for a moment what that 18% maybe costing your organization! “51% of employees are passively disengaged. Although they are not actively trying12 to harm the organization, their negative attitude is contagious. They sow confusion and pull energy from teams with their pessimistic outlook. As “takers" they complain that their needs are not being met and they see themselves as helpless. Passively disengaged people frustrate their teams because they focus on irrelevant tasks and don’t help the team move forward. The passively engaged show up, but they don't contribute much. At their core, they still "take" from the organization. They tend to be task focused and unaware of the big picture or even the impact of their actions on the rest of the team. In fact, they may not even realize that they are on a team! They consume time and energy because they wait for others to tell them what to do rather than actively looking for opportunities to improve the team's effectiveness. They clock in and clock out but do not contribute to the overall mission of the organization. These people are willing to sacrifice for the benefit of others. They empower their team to reach a level of success that isn’t possible without them. They take the time to understand the needs of others and apply their resources and energy to meet the needs of the team. The whole organization is stronger when there are people that are cross-team invested. It’s as if they see the organization through 3D glasses. While actively engaged employees focus on getting their personal work done, and the team-invested focus on empowering their teams, the cross-team invested think beyond themselves and consider how they can impact their sphere of influence. Their motivation can be summed up with one word: OWNERSHIP. They think like owners. They are committed to understanding the needs and victories of the individuals and teams around them. Because they take an interest and ask great questions, they can match resources to the needs of the organization. How would I describe myself? Disengaged, engaged or invested? How would my direct reports describe me? Disengaged, engaged or invested? How would the people I report to describe me? 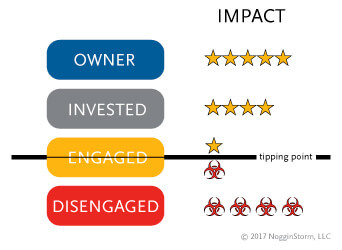 Disengaged, engaged or invested? A collaborative effort is required in order to effectively address burnout, engagement, and investment. Solutions must address both the SYSTEM and INDIVIDUAL issues. Dan Pink, in his book, Drive, lists the three primary workplace motivators: autonomy, mastery, and purpose. Over the past decade, all three have been negatively impacted in medicine. Eric Garton published an article in the Harvard Business Review entitled, “Employee Burnout is a Problem with the Company, Not the Person.”14 Garton makes the point that we must consider the environment, but he falls short by dismissing the role of the individual. To make progress, one must consider both. Effective solutions require providers that are invested. Otherwise, providers will just dismiss the efforts as more “meaningless change” from the administration. Pavlos Deligkaris, Efharis Panagopoulou, Anthony J. Montgomery, and Elvira Masoura, Job burnout and cognitive functioning: A systematic review.